As the Israeli-Palestinian conflict escalates, a dangerous illusion persists that the American Jewish community speaks with a single voice, expressing universal, uncritical support for the policies of the Sharon government. This appearance of unanimity does grave disservice to the heterogeneity of Jewish thought, and to the centuries-old Jewish traditions of lively dispute and rigorous, unapologetic skeptical inquiry. 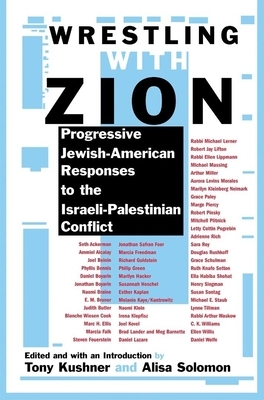 Wrestling with Zion brings together prominent poets, essayists, journalists, activists, academics, novelists, and playwrights, representing the diversity of opinion in the progressive Jewish-American community regarding the Israeli-Palestinian conflict. All the participants share three things: a Jewish identity, an American identity, and a sense of urgency, refusing to ignore the catastrophic injustice that has been visited upon the Palestinian people, while at the same time being passionately committed to Jewish survival and American legacies of compassion and moral courage. The contributors including Nathan Englander, Susan Sontag, Robert Pinsky, Daniel Wolfe, and many others have considered certain essential questions: What is at the heart of the connection between Israel and American Jews? What is Israel's role in shaping Jewish-American identities? How has this role changed historically? And what is the history, both familiar and forgotten, of Zionism's political, cultural, and spiritual meaning?